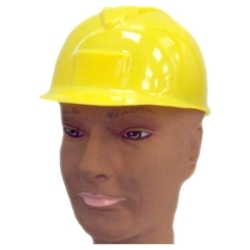 Plastic construction helmet, available in Yellow or White. Construction helmet is made of a rigid plastic and has an adjustable strap for a snug and comfortable fit to most any head size of both children and adults. Great for children for imaginary playtime, a quick and easy Halloween costume, or for dressing up as the construction worker from The Village People.